In the meantime, we have an exciting month as it is right now. You need to hand in your music on a USB Stick to Mr Owain at the latest on Wednesday. This week students in P4 through P6 will have the spring MAP testing and next week M1 to M3 will have their sessions. After we have completed the testing you will be sent the reports that have this testing results and previous results for comparison. These are eventful times at ISM as we transition to becoming UWCEA. As our National Committee offers start coming in from all corners of the globe, it is going to be a very exciting place to be come August. People often say “you should never look back,” the underlying sentiment being that dwelling on the past makes it difficult to move forward in our lives. As our Director, Anna Marsden, mentioned in her announcement to the student body on Monday, as we move forward as a UWC, we must be mindful not to forget or overlook our rich and celebrated history. As Marcus Garvey famously said, “A people without a knowledge of their past history, origin and culture is like a tree without roots.” I agree for how can you move forward with any certainty if you do not know where you have been? Since I joined ISM last year, I have been constantly heartened by the active and visible role so many alumni play in the community. I think it is fantastic that we have students here now whose parents themselves were ISM students in their youth and, even, whose grandparents were students here before them! The number of alumni who have signed up for the Alumni Weekend in July is further testament to this. As I have said so many times, there is something special about this community and people clearly value being part of that. We must treasure this closeness. This familiarity. True, come August, we will have students from many different countries and cultures but, if we are welcoming, open-minded and embracing, this will surely only enhance our community and make it that little bit more special. There are a few projects and initiatives in the pipeline to make sure our 50 year history stays visible and alive…we may well be asking for your help in the weeks to come. At the same time, we have arrived at the final quarter of the school year. This is an extremely significant time for many of us, not least our D2 students who are entering their final few weeks at school ahead of their exams. As all this talk of what is to come, we must be mindful to be present for them and to help and support them in any way we can at this important time. The Summit magazine is going digital-first and cutting down on print editions as the school takes steps towards reducing wastefulness. To pre-order a printed copy of Summit 2019 please email: development@ed.ismoshi.com. A group of students and adults at ISM are building a bench. Not just any old bench, an Eco Brick bench!!! If you make a Eco Brick, it helps the environment. Your challenge is to put soil or wrappers/plastic bags in a plastic bottle and pack it tightly to make an eco brick (see photo). 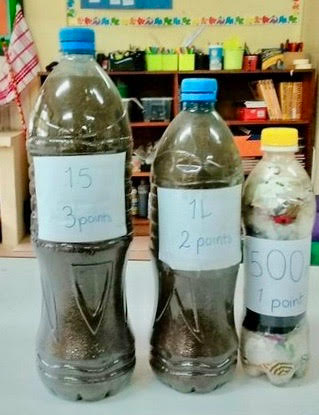 It is going to be a house competition with different points earned for different sized eco bricks. If you stuff the bottle with plastic wrappers rather than soil you will get an extra point! Fill a plastic bottle with soil or other plastic materials. It can’t be squishy or it doesn’t count. Take it to Room 16 (The P6 classroom) at the beginning of the day or at break time. Tell us what house you are in and we will count it. When we have enough bricks for our bench the competition will end. The winning house will get 60 points for their house! Help us build our Eco Brick Bench on Saturday the 13th April. We will be building in the play ground between 8am and 1pm. Wear old clothes and prepare to get muddy! For primary we suggest you plan to spend an hour with your child, helping to build. Please do not leave your child to work on the bench without your supervision. We are also collecting plastic to make eco-bricks at our Earth Day assembly. 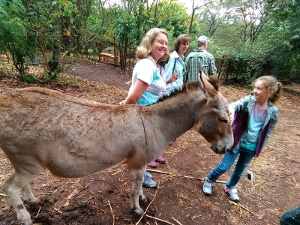 You can help us by bringing your old (CLEAN) plastic bottles and wrappers to ISM and leaving them in the cage in the car park or giving them directly to Dr Mac, room 36. Our D2 students are in the last two weeks and are working with teachers on final revision and preparation for the exams. Thursday the 25th will be their last day of school followed by study week. During this week teachers are available during normally scheduled class times and at other times by arrangement to support students in their preparation. Exams start on Monday May 6th for three weeks leading up to Graduation. More information about Graduation will be coming out soon. For our D1 students this is a critical semester for them in their preparation for university as it is the last full semester before they start the application process. This was communicated to them as a group this week as we started the quarter, but please help us to reinforce this idea and encourage them. We wish to welcome all students for the final quarter of the year. Other than co-curricular activities, quite a number of events punctuate this session of the year with major highlights being MAP tests, M4-M5 end year examinations, M5 work experience and ceremony. The M1 and M2 students began workshops on approaches to learning skills last Tuesday. The workshops cover Self-Management and Communication skills. In self-management, they are covering organisation skills which include use of diary, timetable and packing school materials. In communication, they are looking at note-taking and how to use key verbs (command terms) while writing assessments and assignments. These workshops are scheduled to run for the next two weeks. This trip is slated for May 22-24 at Makumira University. The trip is supported by the Art and Languages departments. The material for the examination above was released on April 1 as scheduled. Students and teachers have received it and currently revising using it. 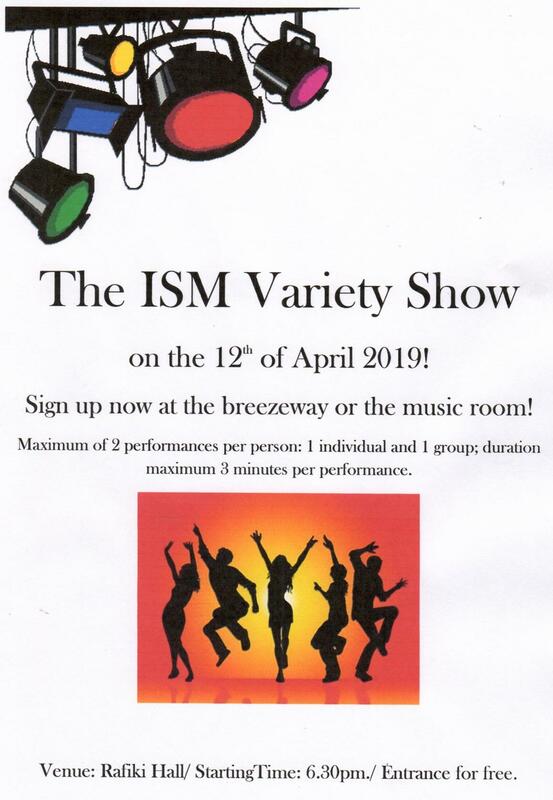 The ePortfolio student work in English and French LA, Drama, Personal Project, Music and Visual Arts are currently being uploaded on IB secure site. This will be completed by April 10. Sports are back in action in the 4th Quarter, starting off with some great rain soaked Touch Rugby training this week. I have never heard so much complaining about getting out to training and like wise I have never heard so much laughter nor seen so many smiles during and after the muddy training sessions. Our U13 mixed, U15 boys and girls and U19 boys and girls Touch teams will travel to ISMAC this Saturday for their first tournament in the NTAA this Quarter. We wish them the best of luck as they start their campain to be crowned NTAA champions. See the table below for what is still to come this Quarter. 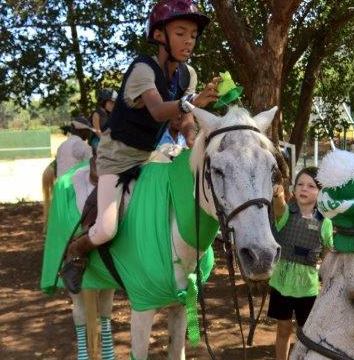 Prior to the break we had an Equestrian event for St Patrick’s Day, when students taking part in horse riding lessons were able to showcase their skills and enjoyment. 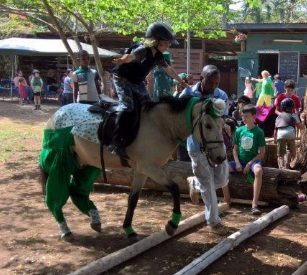 “The St Patrick’s theme Team Challenge winner this year was Meru. A tiebreak for second was won by Mawenzi. The Leprechaun’s pot of GOLD was found by LUCKY Paige and Kayla. 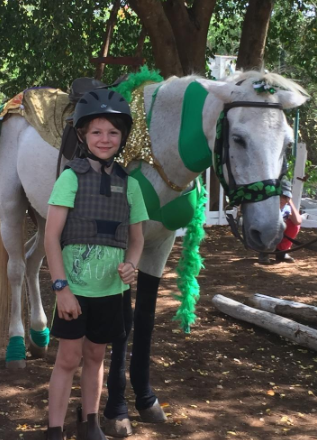 There were many festive outfits this year, although one Mare did get a little carried away, and was warned for breaking the school’s dress code… let’s hope she uses better judgement next year!” (Terrie Emmanuel, Organiser). Next week we will be running an inter house basketball competition for M1-M4 and M5-D2 with the same format as the indoor soccer. House captains get your teams organised and ready to play. Welcome back for Quarter 4. Please note that the Easter break falls on Friday 19th to Monday 22nd April. This will be the first time in a long time when we have this break when boarders are on campus. We therefore have no classes on Friday 19th and Monday 22nd respectively. There will be activities planned for this weekend, but parents are free to bring their children home for the celebration. Kindly let us know by Monday 16th April if your child will come home for Easter, and also share transport details with us. This is the final quarter for the D2 students, and as expected, they are all preparing for their final examinations which begin early next month. Their last day in class will be Thursday April 25th. The following week they will begin their study leave. During this period D2 boarders will be allowed to study in their dorms but are encouraged to come to school for consultation with their teachers. Various activities are planned for the weekend to involve the boarders, including a disco, karaoke and football. 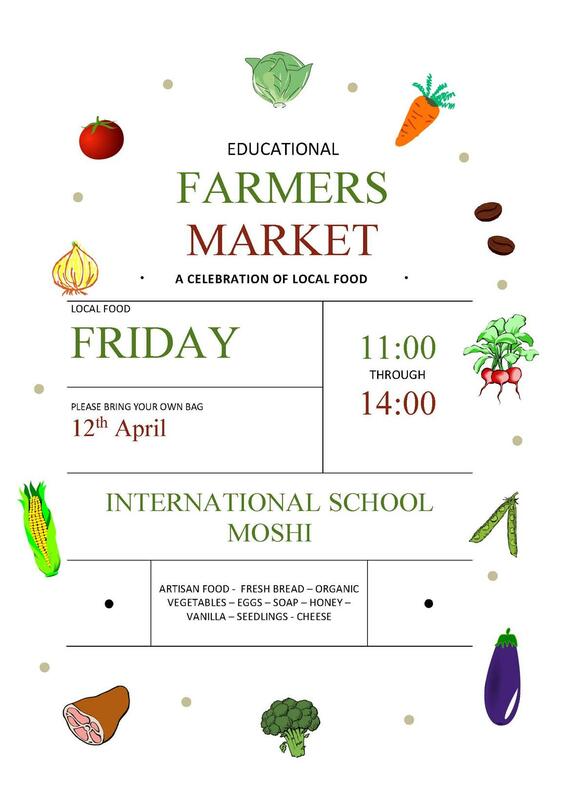 It is great to hear the sounds of happy children around the school and relaxed looks on the adults’ faces. The first week has gone smoothly for all and already been an eventful one for our P6s. 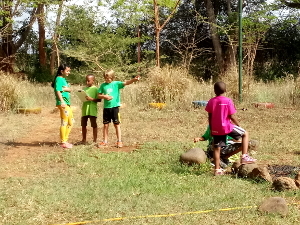 In their Exhibition groups, they have been on various field trips and are iniating some very exciting Actions. The EC class is an amazing space and the young learners are having a time of their life creating stories and letting their imagination run wild. Next week, the P4s, P5s, and P6s will be working on their MAP tests. Students are confident and prior preparation for this exercise is not necessary as their current ability and progress made from the last test are what is required. Results and more details will be shared with the parents by Mr. Cofer once we receive them. Clubs: All students that were signed up for clubs have received their selections. If there are any errors kindly email me and I will correct the information. If you have not signed up your child, kindly send me an email with your child’s name, class, and selections. We all have our stories. Some were told to us by our parents or grandparents. Some we found in books, plays, music and film. Some stories we created for ourselves and others in everyday life. Stories remind us of who we are and who we might be. They tell us about our history, inform our values and provide us with a sense of wonder at the myriad possibilities and opportunities in life. Some may have been realised, some passed over, and some will seem forever beyond reach (we probably won’t ever actually ride a dragon… an exhilarating idea as that might be). It’s clear though that throughout human existence we’ve taken stories and made connections with them in our own lives. A story of fire teaches generations how to produce it. Todays dream of ‘training your dragon’ might translate into an interest in flying. Who knows where that might lead… if we as adults can find just a little time in our busy lives to cherish and acknowledge childrens thoughts and dreams as both valued and valuable? Can you identify any stories or narratives in your own childhood that have guided or informed you to take a path that might have brought you to where you find yourself today? Our Central Idea is that “The art of storytelling uses many different devices that develop our understanding of the world”. 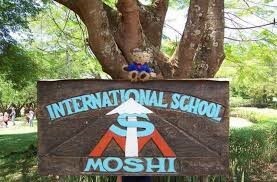 Lets see where the children take us over the next few weeks. Please take time to read and share stories (real and imagined) at home. Is this powerful and very human tool for learning somehow becoming lost in our fast paced and technological world? Do stories still matter? Are the stories that we co-create each and every day important and worthy of reflection? P1/2’s have been looking at names. All things have names; people, places, things, ideas and so on. They labelled various things in the classroom. They also got together and began to name natural resources around us. 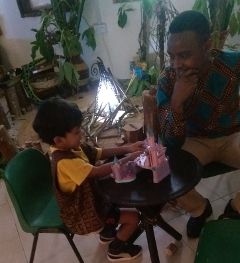 It was interesting to note the discussions that arose as they began to formulate their understanding of the meaning of natural versus man made. We will continue to look at this next week as we start to sort the resources we listed. We had fun exploring fractions with songs and games this week. The children particularly liked this video by NUMBEROCK https://www.youtube.com/watch?v=lTce7f6KGE0. We explored the concept of a part and a whole. 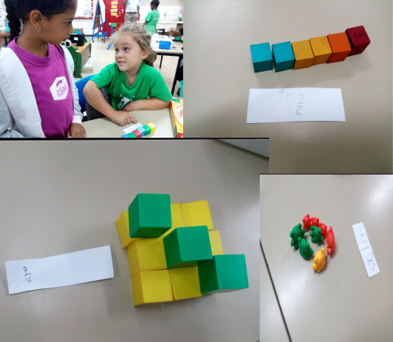 The children truly extended themselves and created as well as shared various models of fractions that can be seen in the picture. This coming week, we will investigate halves, thirds and quarters in fruits and pancakes, delicious lessons indeed. Homework will be sent on Monday. For those who have started taking chapter books home, please do take time to talk about the books together and share who, what, where, when, how and why statements. What an eventful first week back its been! We have been raking, hoeing, feeding hens and roosters, and exploring vegetable patches. We have also planted sweet corn and are eagerly awaiting our yield. Our planting journey has been documented and can be seen outside our classroom. The students, myself and Ms. Durriyah would like to thank Ms. Heloise Jackson and Mr. Coen Everts for their help this week. 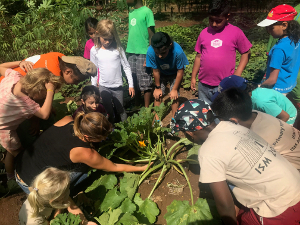 Ms. Jackson let us visit her family’s vegetable patch and coop, taught us about the various vegetables, showed us the biggest courgette I have ever seen, and explained how the family makes their own compost. Mr. Everts brought in lots of help as well as sweet corn seeds to plant in the community garden – monkeys beware! The students have also been working on their multiplication. We have brainstormed various strategies and students have spent time playing multiplication square games, as well as creating multiplication flowers which will be displayed in our class. We have had a smooth first week and it was great hearing of all the wonderful holiday news. I have particularly enjoyed hearing how the students respond so articulately to many of the discussions we had over the week. It is amazing how much they have grown in the short break. We will be having MAP tests throughout next week and no extra preparation is needed towards this. For UOI, I encourage students to bring resources related to the unit e.g. books, DVDs and magazines if they have any at home. We will specifically be focusing on what biomes are and the different types of biomes. In Language, we will work on Report writing whereas in Math we will apply our knowledge of graphs and measurements. We have also been reviewing concepts we covered in the past 3 quarters and making connections with some new concepts using ‘number talks’. The P5 students enjoyed their week back together in school. As young authors they are developing skills writing personal narratives. Today, each child shared a memory from their Spring Break using detailed language. I was impressed to see their growth from our first narrative at the beginning of the year. It sounded like everyone had a good holiday, full of fun weather and earthquakes! This week we began our new unit on the Systems of the Human Body. In small groups they are exploring the circulatory, respiratory, and digestive systems. Next week for homework they will be asked to be active daily, and record how their body responds. They will also keep a log of food that they eat, and how their body feels after consuming fuel. Their curiosity of the body has been sparked, so you may be hearing questions at home. Please make sure children have their water bottle and hat daily. Monday, 15th April the P6 children will present on their Exhibition journey so far, as part of the whole school Earth Day assembly. We hope to see many of you there.